Hummus is the Arabic word for Chickpeas, and the actual name of the spread we all know and love is “hummus bi tahini” (chickpeas with tahini). In Italy, the spread is commonly known and referred to as Hummus di Ceci, which humorously enough translates into chickpeas of chickpeas :-). I love it. I was telling my BFF and her hubby about this and they were quick to point out other examples of the misuse of words in different languages. For example, Chai, which is the Arabic and Indian word for tea, has now become synonymous with a particular blend of spiced tea. So the next time you’re at the local cafe ordering a chai tea, remember that you’re just ordering a tea tea ;-). This delicious spread is a staple in any Lebanese household and I grew up eating kilos of the stuff weekly. I once read somewhere that Natalie Portman claims to “eat her weight in hummus everyday” and can you really blame her? I’m guilty of the same thing myself. Besides being finger licking good, there are a variety good reasons for eating hummus every day. Chickpeas are the primary ingredient and they are naturally high in protein and dietary fibre. Tahini, a paste made from ground sesame seeds, is the secondary ingredient used to make this delicious spread and is an excellent source of protein, calcium and unsaturated healthy fats. It’s also vegan and macrobiotic friendly. Hummus bi tahini is a great lunch box food. Spread it on pita bread or toast or pack it in a small container and use it as a dip for crackers and vegetables. It’s also a great choice for potluck gatherings as you can transport it easily without having to worry about how it’s going to look when you get there. It makes a great snack! For those “in between meal hunger pangs”, hummus bi tahini is a satisfying snack that gives you a boost until your next meal. I like to spread it on a slice of unyeasted sourdough bread and have it with olives. Besides having to soak the chickpeas overnight and then cook them for over an hour, the spread itself is easy to prepare. Just whiz the ingredients together in a food processor and you have a table ready spread in 3 minutes flat. If you’re like me and you don’t always have the time to soak chickpeas you can use pre-cooked chickpeas (in a jar and preferably not canned). Perfect when you must have hummus bi tahini now, or else! Place chickpeas, tahini, lemon juice, garlic, sea salt and 1/2 Tbsp of the reserved cooking water in a food processer and mix until well blended. Add reserved cooking water a bit at a time and continue blending until you achieve the desired consistency; creamy and spreadable without any chunks. 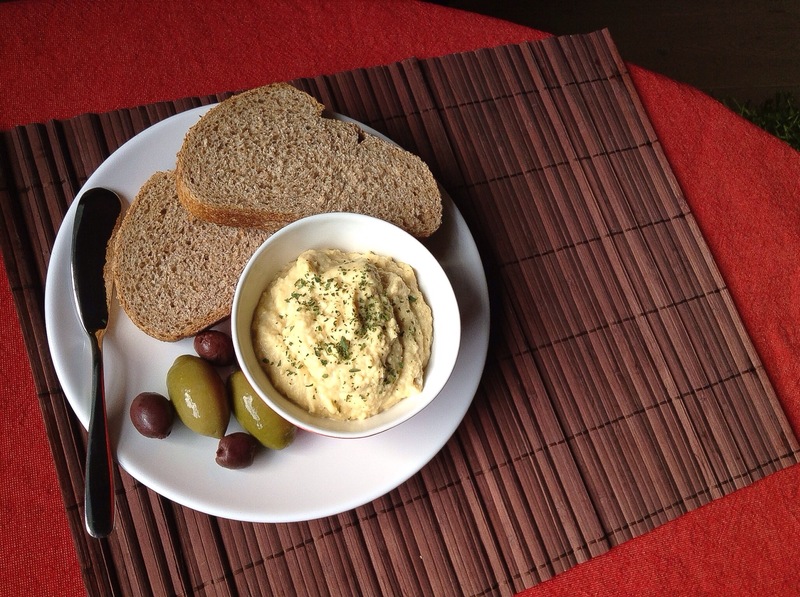 Spread on pita, crackers or toast or use as a dip for veggies. Eat and repeat daily!